This is my favourite portrait of the bride and groom captured during their Country Heritage Park wedding. Please see the complete album at Country Heritage Park Wedding guide. As a Toronto wedding photographer, I rarely photograph barn weddings. This venue in Milton offers the perfect setting for small or large wedding. 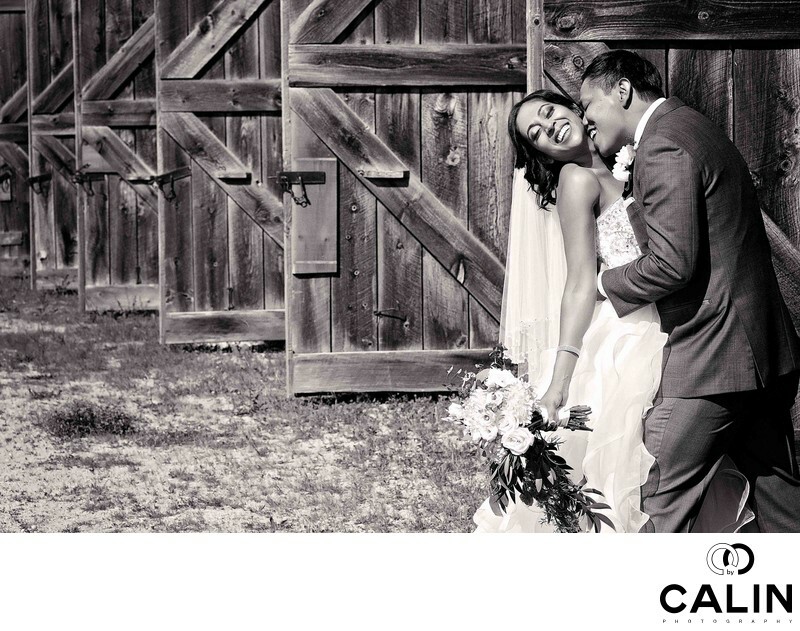 After the bride and groom had the first look at the Carriage House, not too far from Gambrell Barn, we went for a quick photo shoot right before their outdoor wedding ceremony at The Cassin Farmstead. Interestingly enough, none of my clients once to be posed on their wedding day. Posing has such a bad reputation that the bride and groom wants to avoid it at any cost. However, on their wedding day, clients who previously confessed how much they hated posing, candidly (the pun is totally intended) asked me to give them directions. As such, I never otter the word posing but I always direct my clients so that they look perfect in their wedding photos. A good Toronto wedding photographer needs to learn the art of making the images look candid even when they are directed. This is such image. While passing by the barn across from the Carriage House I noticed the beautiful barn doors that creative a repeating pattern, a sought after composition element. As such, I positioned the bride and groom towards the right edge of the frame according to the Golden spiral. In effect, the couple is breaking the pattern created by the repeating barn doors, which makes this an even more powerful image. There are a few more elements that add to this photograph. First, the barn doors create leading lines towards the bride and groom. For this picture, after I posed them, I asked the groom to bite the bride's neck and tickle her. The reaction was spontaneous and genuine. We can see the groom nibbling at his wife's neck while she's laughing turned towards the camera. Light is the most important ingredient in a good wedding photo. This image was taken around 1 PM on an August day when the light is harsh. Still, because I posed the bride and groom and turned her face towards the sun, there are no harsh shadows on her beautiful face. Technique is an often neglected element of a good shot. Unfortunately, many photographers shoot weddings in P mode totally ruining the opportunities presented by the location in the bride and groom. Because I shot this image very tight, eliminating any a recognizable landmarks, the viewers' focus goes directly to the bride and groom. For this image I used the 35mm f1.4 lens and I shot it at f5.6 so that the barn doors behind the bride and groom are in focus to create leading lines which emphasize the couple. Also, besides the leading lines we have another important composition element: the triangle I can count at least 10 triangles in this photograph, which makes it very appealing. As I mentioned before the interrupted pattern is another composition technique that increases the value of this wedding photo. Finally, in post processing, I desaturated the picture and converted it in a black and white image, then dodged and burned the photograph and increased the texture of the barn doors to create a stunning image. Location: 8560 Tremaine Road, Milton, Ontario L9T 2Y3.